The World Bank’s Doing Business Index measures the ease of doing business in countries around the world. The highest-ranked countries have the simplest regulations on businesses and the strongest protections of property rights, which together enable a thriving private sector. A country’s ranking is based on its scores in ten areas: ease of starting a business, dealing with construction permits, getting electricity, registering property, getting credit, protecting investors, paying taxes, trading across borders, enforcing contracts, and resolving insolvency. The World Bank scores countries in these areas by studying laws and regulations and consulting with in-country government officials and professionals. The recently-published 2014 index ranked Singapore as best in the world, followed by Hong Kong, New Zealand, the United States, and Denmark. Since the first Doing Business index was released in 2004, countries have made an effort to reform their regulations and remove the “bureaucratic obstacles to private sector activity” to improve their rankings on the index. The “most-improved” countries that best reformed their regulatory systems between 2012 and 2013 were Ukraine, Rwanda, the Russian Federation, the Philippines, and Kosovo. While these countries are still generally ranked low on the Doing Business index, they were able to improve their scores and their business climates in the past year. 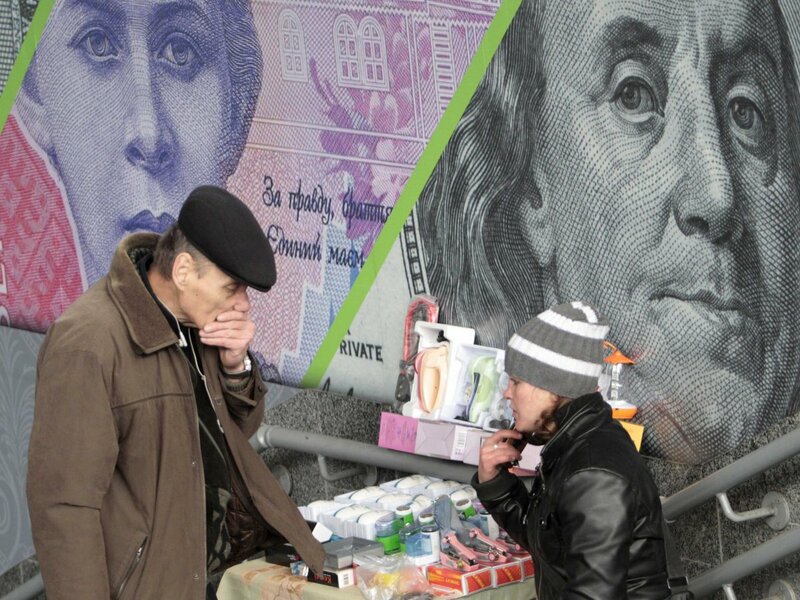 This is not the first time Ukraine and Rwanda have been on the “most-improved” list; Ukraine placed second between 2011 and 2012, and Rwanda was ranked the second-best reformer in the six-year period between 2005 and 2011. 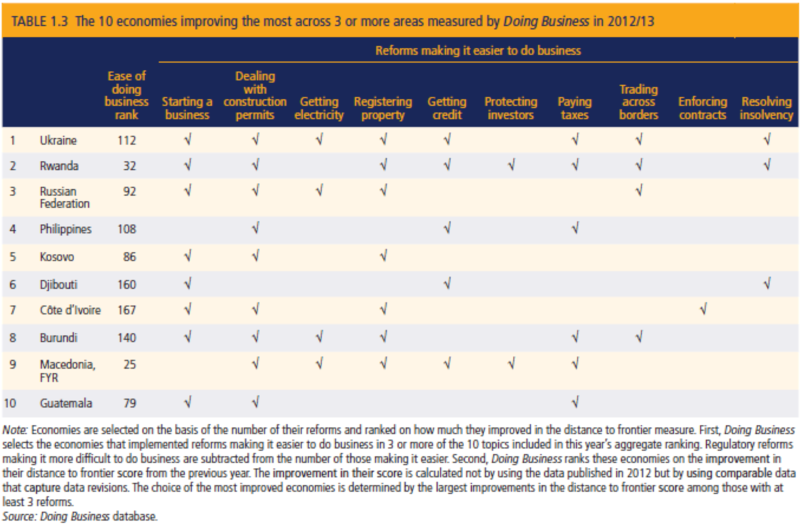 In the past five years, the two countries have implemented reforms in every area measured in the Doing Business index. 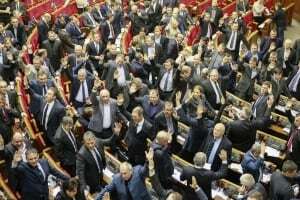 Between 2012 and 2013, Ukraine simplified many of its complicated procedures, making many aspects of doing business in the country easier. It streamlined procedures for registering businesses and obtaining construction permits, simplified tax forms, implemented a new customs code which makes it easier to import and export, and changed the bankruptcy laws so that insolvency can be resolved easier. During the same period, Rwanda made it easier to obtain a registration certificate for a business, streamlined the processes to obtain construction permits and transfer property, and strengthened protections for investors. Rwanda has also been using technology to streamline its business processes, implementing the online Land Administration Information System for processing land transactions, rolling out an electronic tax filing system for businesses, and introducing an electronic single-window system at the border to make cross-border trade easier. Ukraine and Rwanda are still hardly the best places in the world to conduct business; Ukraine is ranked 112th overall, and Rwanda is ranked 32nd. Nevertheless, these countries have been making a serious effort to improve their business environments, because doing so can lead to huge payoffs. International businesses entering new markets look to the World Bank’s Doing Business index to determine whether they should invest in or move into a country. A good score, especially compared to a country’s regional neighbors, can help that country attract foreign direct investment, bringing capital and employers into the country. The Doing Business index is not only providing incentives for improvements in regulations and property right enforcement, but is also making it easier to track such reforms in countries like Ukraine and Rwanda.